Hey very thorough post! I, too, was waiting for the price to drop… I saw the benefit even when it was $300 but couldn’t bring myself to fork over the cash. I ordered my kit last night and thought I’d do what most bloggers would do and blog about it. I’m looking forward to it! It’s well worth it. Everyone has something cool to discover in their DNA. I’m glad you bought it! p.s. Your website, pleasehealthyourself, seems to be down. Hey thanks for the heads up about my site being down… Not sure what was going on but it seems to be working now. Exactly! I look forward to hearing what you think when you get the results. Since I made my results public on 23andMe, I’ve been getting messages saying “hello, I’m your very distant cousin, could you please help me complete my grandfather’s family tree?” followed by a list of names I’ve never heard of. You’ll have that to look forward to soon, and might even discover some extended family in the process! Hello, I have a correction to present to you. Neanderthal genes are found in higher percentages in East Asians and Austronesians (as high as 7%), although in Africans the Neanderthal genes are nowhere to be found. More Neanderthal genes doesn’t necessarily mean more white. Having 800 odd distant cousins seems pretty amazing, I was thinking of doing this test but then the genographic project caught my attention so I’m deciding which one I should do. Genetics are interesting stuff! On further inspection, the genographic project looks a bit like a scam… 23andMe gives you a better service with concise descriptions on a simpler website, while the genographic project gives you inferior results with over-elaborate descriptions. 100% 23andMe! Thanks for your suggestion, I’m glad I could get some opinions. Now I’ll just add 23andme on this years to-do list. James – do you want to send me some of the names you have received from distant cousins? If they are related from the same great-grandparents I may recognise some of the names from your dad’s family tree. It may also give me some hints towards information i am missing and help with some of the dead ends I have been coming up against. I’ve heard of 23andme before but hadn’t really considered using it until I read this. 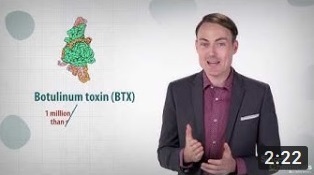 HIV-resistance? Slow caffeine metabolism? It’s crazy that you can now know that! Yes! Those results are the most interesting. However, I studied genetics and I know to take the “genetic disease risks” with a massive pinch of salt. Our lifestyles are still by far the biggest predictors of health or disease. I just got my results from 23andme. I am confused about the chromosome tool. Does each chromosome represent both parents? How does one know which line represents which parent? I know the question probably sounds completely ignorant but I am when it comes to this new hobby. You have 23 pairs of chromosomes (total of 46). One chromosome of each pair is from your mother, while the other is from your father (total of 23 from each parent). To tell which chromosome came from which parent, you’d have to test both parents’ DNA and then do some further computational analysis. If you’re looking for, say, the maternal chromosome in the chromosome tool, it could be the top one of pair #1, then the bottom one of pair #2, then the top one of pair #3… it’s random. I studied Biology at undergraduate and did a lot more analysis than most people when I was using the “chromosome tool”. 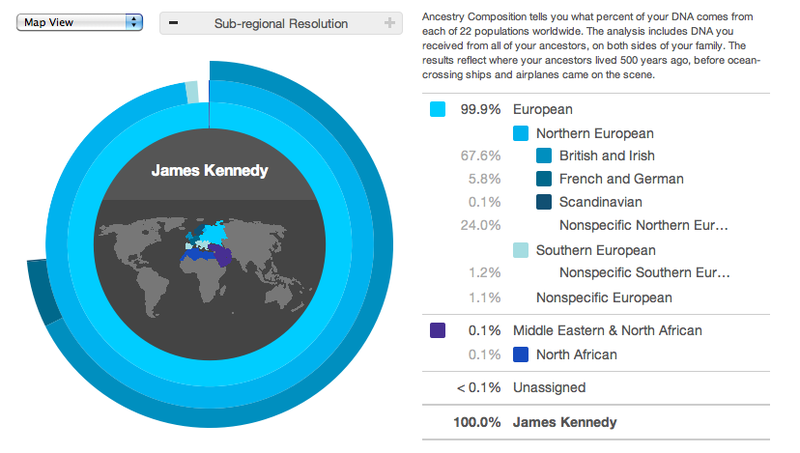 If you like, share your ancestry data with me (not the health stuff) and I’ll see what I can interpret from it. Kind of you to help me. Yes I can share my ancestry data. I am Azoreanilander at 23andme. Forgive the dumbness, but could you clarify this? “I calculated generations by taking the percentages, log base 2 and multiplying by -1.” It’s been a long time (40 years) since I used any math other than basic math. I’d like to calculate the generations on my profile. Thanks! The result is “3”, which tells you that someone 3 generations ago was pure Indian. Change the “0.125” in the formula to reflect the percentage you want to look up. “3%” should be “0.03”, and so on. The ancestry is certainly interesting and will keep you occupied for a few days. Take the health stuff with a huge pinch of salt, though. Good luck! sent mine in, can’t wait for the results!!!!!! Are you worried that the company could use your results against you some day? Maybe turn you down for insurance due to a test result? I’m not worried at all. The health results are far too ambiguous to justify any form of discrimination. Hi James, I did the 23andme test and have spent hours on trying to figure out what it all means and still don’t feel I’ve made much progress. Am I able to send my results to you and have you help me out? I’d be glad to pay you for it. Thanks. Hi James: Thank you for the informative article. I love 23andme ! Yet, I have explored my 23andme account and cannot figure out how to view those blue bars of French/German DNA on the arms of chromosomes as you descripted in items 11 and 12 above. Could you please tell me how you did this ? I would greatly appreciate it. OK…looks like I’m O-neg (which I already knew) and H3 (which is news to me, and had never heard of this before 23andMe) and I’m mostly British & Irish, with a little French & German. Very cool, because I was adopted in 1948 and know very little about my birth & adoption. My adopted younger sister gave me the kit for my birthday. (she is also looking for answers about her birth parents) I sent to Austin TX for my adoption records in 1993, but TX records are closed, so they sent me a packet of papers with every name & place cut out (an non ID) so that’s a bummer. However, in reading through the papers, I was able to figure out a few things. My birth mother went through the Children’s Aid Society of West Texas in Wichita Falls TX. They helped her buy a bus ticket and placed her in the Rest Cottage, A Home For The Unwed Mother & Her Child in Pilot Point TX, where she gave birth to me 8-10-48. I was adopted by Kathryn Ann & David C. Black & raised in Wichita Falls. I moved to Omaha NE in 1969, then to Marquette NE 4 yrs ago. My birth mother was born April 13, 1917, she was 31 when she gave birth to me, and my birth father was 38. She was an “office worker & secretary” and birth father was a “businessman” (sounds like an office romance). She had 3 brothers & 1 sister. Her mother & father lived on a ranch 18 miles (some direction that was cut out) from Wichita Falls. Handwritten underneath this was: 2nd child – gone 1st one to agency in (cut out) or (cut out) * This indicates to me that I was the second child she gave up for adoption. On the father’s side of the paper, it says “some brothers & sisters unknow amount”. The only other tidbit I have: my adoptive mother once told me that my birth mother’s last name might be Gryder or Grider…but, I do not know if this is true. I am now 66, married 41 yrs, have 3 grown married children & 8 grandchildren. I doubt my birth parents are still living, but my children & I would really like to know about my background & heritage. station about stories of people looking for their Biological parents through investigation. Being a retired NYCPD officer I am intriqued by their detective work, they are great! The are both adopted the mans name is Chris & the oriental woman I am not sure. At the end of the program they ask if you are looking for your parents contact them. I will watch it tonight & try to help you. Try to contact the TLC station or watch the program. I have DISH TV. Good LUCK! I saw that Kennedy is one of the top surnames for my relatives on 23andMe. I was interested in seeing if I’m related to the Kennedy family here in America so I Googled it and found your article. Right afterwards I checked my 23andMe report. Hi, I’m your 3rd-to-distant cousin, whatever that means. Hi Elaina. It means we have some DNA in common, which is interesting! Do you know of any family in Europe? I don’t have very close relatives from Europe – great-great-grandparents from Ireland and Germany, and great-grandparents from Poland and Lithuania. I have a lot of matches from Ireland and UK especially, although that’s probably because those countries are more likely to use 23andMe. You realize that you just paid to give your genetic information to a company that’s going to sell your data, right? Do your research. Google knows far more about you than 23andMe knows about me. Google sells your information, too. Who cares if they sell it? Does it hurt him? Nope! 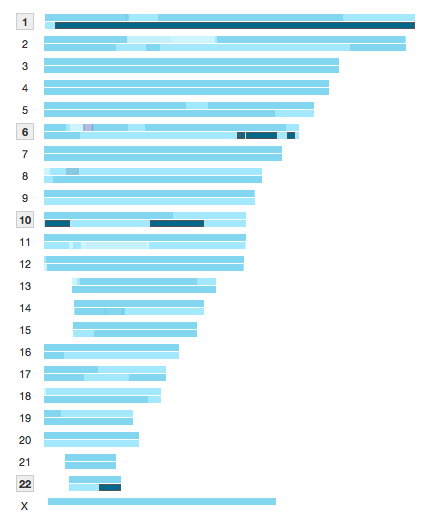 If you subscribe to 23andMe’s newsletters, which I do, you’d realise that they’re REALLY scraping the barrel to get any “meaningful” data from the huge amount of genetic information that they’ve obtained. Their last “discovery” was a collection of 35 candidate genes that “might” be connected to motion sickness. Wow. Having more than the average Neanderthal DNA doesn’t mean you’re “whiter”. For instance, I believe East Asians have on average higher percentages than Europeans. Actually, Europeans and people of Middle Eastern decent have the highest concentrations of Neanderthal DNA, Asians are speculated to be closer to the Homo Erectus. Chinese anthropologists seem to think that modern humans evolved in China independently of those in the rest of the world. Given that we are now the same species, this seems improbable to me. Thanks for sharing your 23andme results, James. 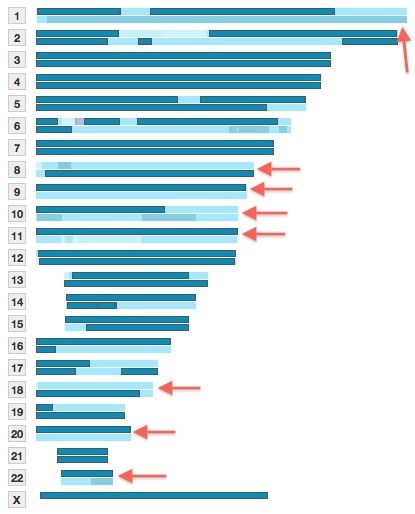 One thing that’s interesting is that you and I both have a tiny, wee North African segment at the *exact* same spot on the top bar of Chromosome 6. On my 23andme results, this small segment disappears when set to the Conservative calculator, which tells me it’s nothing but “statistical noise”. I mention this because I have seen others like us with exclusively Northern/Western European ancestry who have this same tiny speck of North African segment on the exact same spot on Chromosome 6. Not sure what this is about! I have recently gotten results back from my 23andme test. Two of my relatives show their paternal Haplogroup being R1b1b2a1a. One ends in d* and the other ends in c. We came from Britian and Ireland, with lots of other mixes. Do all the letters and numbers indicate British and Irish decent? I am from Southern England, had my Test done in Dec 2015/ my two children waiting for the Y Chromosome from my Boy with his Fathers data. Some interesting finds on the data. I am 100% European.. 71% English/ Irish mainly. 1.2%Scandinavian /Dutch/Danish. French/ German the rest..My daughter alarmingly has 0.1% Yakut which is Siberian/Russian, from her Father’s side..on Chromosome 6 wonder how far back that would be PLEASE advise? Orange blot on C6..
My MtDNA is U3a1 am told this is a rare haplogroup. Do you know anything about this Group? The 23&me report does not define the difference between Irish English Scots Welsh.. They lump us all together and call us British.. Well I am 70.5% overall although Paternal side Irish completely..Celtic, have a few Kennedy’s on my page too.. Paternal side Lafferty or variants of the name. O’Laverty. My daughter has 0.1% Yakut/Siberian/Russian from her Father’S DNA..blot of Orange on C6.. East Aisia…Can you advise how far back that would be please? Suprise to us? Very interesting results, you say 833 of your distant cousins had their DNA tested. Does the website provide you with their contact information? It gives you the option to message any of them through the site. It’s rather like a social network: they have to accept your invitation before you can see their full data. •	Have you had your DNA analyzed by 23andMe? •	Are you 18 years or older? •	Are you sexually active, or have you been in the past? If you answered YES to these questions, you are eligible to participate in a study on sexual orientation. The purpose of this research study is to understand how genetics may influence people’s personalities and sexual orientation. If you take part in this online study, we will instruct you how to find your genetic data file on your 23andMe account and upload it to our secure website. We will also ask you to complete a series of questionnaires on your personality and sexual behavior. Time required to complete the study should be about 15-25 minutes. Anyone 18 years or older who has been sexually active and has had a 23andMe analysis is eligible to participate, regardless of sexual orientation. This study is being conducted by the Department of Anthropology at Penn State University, 409 Carpenter Building, University Park, PA. Please contact the study coordinator Heather Self (hls5216@psu.edu) or the principal investigator David Puts (dap27@psu.edu) for further information. I am English from the Lancashire/ Yorkshire border. I am interested in the history of the Anglo Saxons and ask if the DNA test ( 23&me) will give me an indication of my Anglo Saxon/ Celtic heritage. A vague indication only. You might get a percentage figure of how “Irish” or “Scottish” your DNA is; and an indication of paternal lineage. James, kudos for posting your dna data online and discussing publicly. I have just recieved my results and i have fairly similar percentages to you. Hi James, re: independent evolution of the Chinese from Homo Erectus…There’s an interesting current BBC documentary “The Incredible Human Journey” which addresses this story and explains how it’s been completely debunked. A large random study of hundreds of Chinese from all ethnic groups show they are all traced back to the same small group that left Africa around 80,000 years ago. I did suspect that patriotism was skewing conclusions. I recall the entire theory was based on one skeleton found in China. Hello James. I sent off my kit and am looking forward for the results. Will this test also show % of Native American? Hi there! This can be our first stop by at your site! Were some sort of team involving volunteers in addition to starting off a fresh project in a local community inside exact same market. Your website furnished all of us practical info to be effective in. You’ve got done a new outstanding work!